A pilot's most important decision is always made outside the confines of a cockpit. To fly or not to fly. From the nuances of a fidgety windsock to the occasional loose nut on an engine exhaust flange, one must weigh a lot of information before deciding to take wing. It is Friday, April 28 2006, and I am flying at 5500' over southern Michigan. The decision that brought me here was the proverbial no-brainer. The ride is smooth, the sun dazzling, and the visibility is exactly what the guy who coined the phrase "severe clear" must have had in mind. A high pressure center floating somewhere in the vicinity of Montreal is providing an extra 20 knot push toward my destination in Kalamazoo, MI. 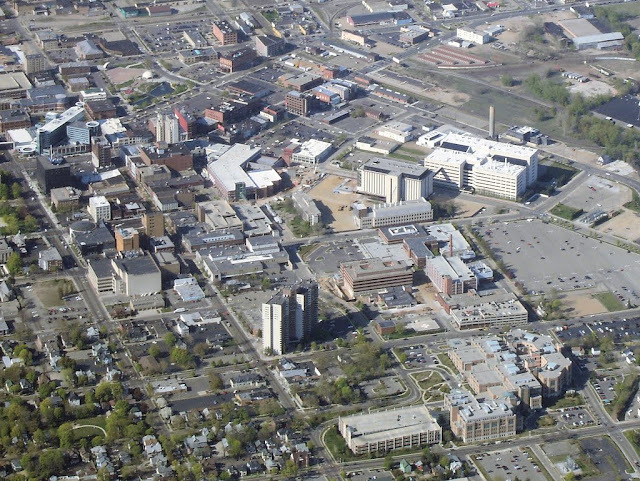 I moved to Rochester, NY four months earlier, though my wife still lives in Kalamazoo. Usually, I make the seven to eight hour trip by car. But on this day, favorable weather led to a faster, and far more enjoyable, mode of westward travel. It is a perfect flying day. With the completion of an annual inspection four flight hours previous, I can say with confidence that the Warrior is literally firing on all cylinders. It is my first time in Michigan skies since relocating the Warrior to Le Roy, NY. 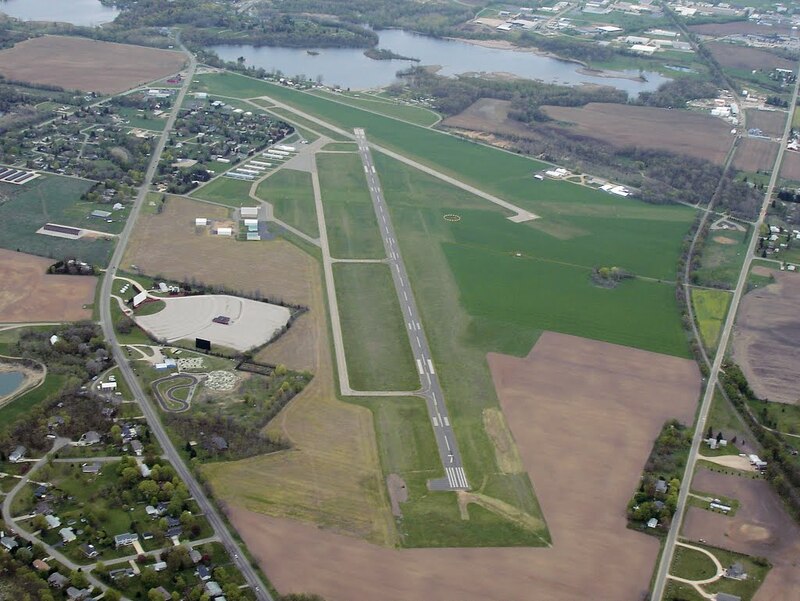 After four months of Unicom radio chatter from unfamiliar Upstate airports, tuning 122.8 MHz brings forth a welcome cacophony from the ubiquitous student pilots in Allegan (35D), my former home base in South Haven (LWA), and my destination in Three Rivers (HAI). With a 20 knot tailwind, my flight from Le Roy (5G0) to southwest Michigan required a mere three hours. I am early and my wife will still be at work. Rather than twiddle my thumbs at the Kalamazoo airport, I take the opportunity to visit Three Rivers. 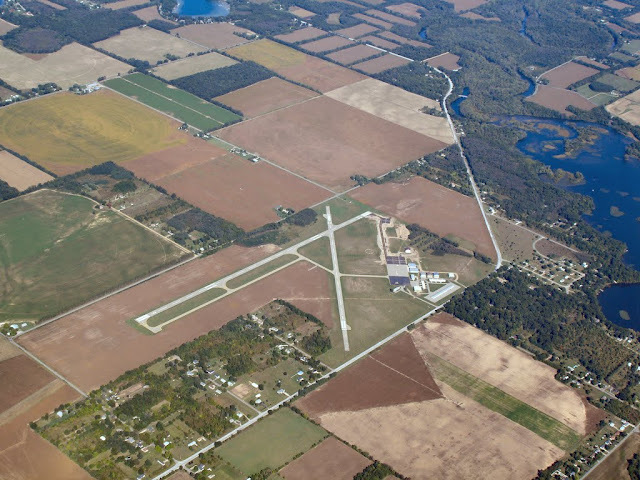 I trained for my private pilot certificate at this non-towered field south of Kalamazoo and entering the pattern there feels like slipping on a favorite old shoe: it just fits. I park the Warrior on the ramp under the warmth of the afternoon sun. As soon as I am out of the airplane, John meets me on the ramp and shakes my hand. John runs Conrad Aero, the Three Rivers flight school where I learned to fly. As a mechanic, he helped me during the purchase of N21481 and then took good care of her maintenance needs until I moved to New York. I talk with John for some time about new developments at the airport and tell him about my first few months in New York. We also discuss my recent annual inspection in New York because I am concerned about the way the shop remounted my propeller. It now stops in a different position and I have noticed new vibrations during takeoff since the change. I ask John if something might be slightly out of balance as a result. He concurs and I resolve to ask the mechanic in New York about this upon my return. I call my wife to check in with her. Apologetically, she explains that she is running late and will not be available for another couple of hours. John has work to do and I have other places to see. Within a few minutes of saying goodbye to John, I am back at the Warrior's controls with the engine humming a smooth idle. I taxi out to runway 27 on a new taxiway that I have never used before. Climbing away from Three Rivers, I note the unusual vibration in the Warrior again, but it ceases once I level off. 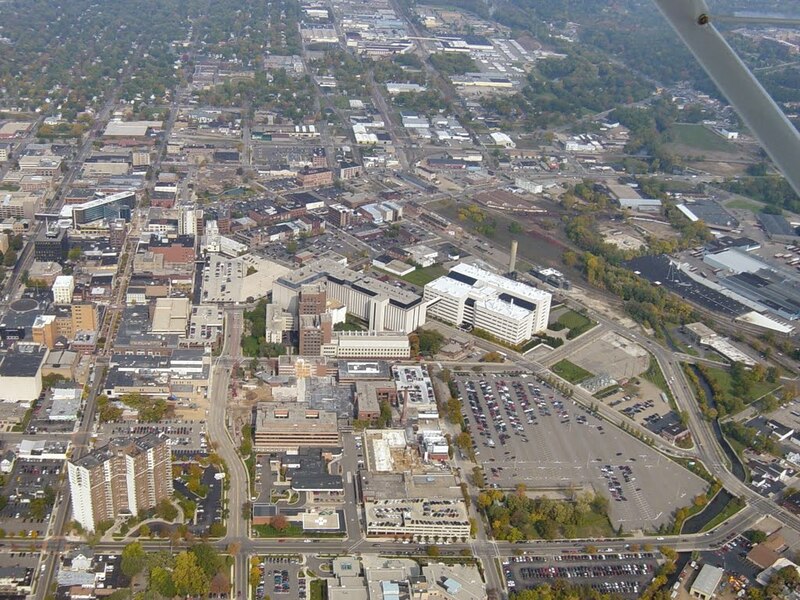 I savor the perfect flying day by dropping in on my former home base at South Haven and doing some sightseeing over downtown Kalamazoo. The skyline has been radically altered from the razing of some downtown buildings by my former employer. My morbid curiosity satisfied, I land on runway 5 at Kalamazoo in dwindling daylight. Per ground controller instructions, I taxi past the rear ends of a couple Embraer RJs parked on the commercial ramp before reaching the tie downs outside of Duncan Aviation. Once she is safely tied to the tarmac, I pat the Warrior's spinner in silent thanks for the wonderful flying day we have shared. I contemplate the unusual position of the stopped propeller for a moment before hefting my bags and ambling toward the Duncan Aviation lobby for a much anticipated reunion with my wife. Despite the triumph that is modern meteorology, weather forecasts remain best guesses of future events. It is certainly true that these guesses are far more educated than they were during the days of Lindbergh. But they still describe nothing more than a potential future. There are no assurances. The weekend weather was predicted to be entirely free of precipitation, but new data show a weather system approaching more rapidly from the west than originally forecast. Though I would prefer to stay in Kalamazoo for the full weekend, the changing weather leads to another "no-brainer" decision. If I leave Saturday afternoon, a mere 24 hours after my arrival in Michigan, I will be aloft and home ahead of the weather. During preflight, I am surprised to find the Warrior's oil level down to six quarts. She prefers to run at seven quarts and will defiantly cough any excess onto her belly through the engine breather. Normally, she consumes a quart of oil every nineteen to twenty hours, but now she is a quart low after a mere eight hours of flight time. This is still within what Lycoming considers normal, though it is unusual for my bird. I cannot find any obvious indications of a leak under the airplane or inside the cowling and the rest of the Warrior appears to be in nominal condition. I add another quart of oil, listening to it gurgle as the Warrior greedily drinks it down. In doing my flight planning, AirNav revealed that Portage County airport (29G) east of Cleveland has very inexpensive fuel. With this fuel stop only two hours away, I decide that I will stop there, reap the advantages of modestly priced avgas, and check the oil again. Harbingers of the storm have already swept over Kalamazoo. The skies darken from an 8000 foot overcast and the wind begins to gust from what seems like all directions at once. With my takeoff clearance received, I speed down Kalamazoo's runway, a ridiculously huge slab of asphalt for my single engine Warrior. Aloft, I place Kalamazoo at my tail and steer toward Toledo, Ohio. I cross over the top of Coldwater airport, a former Sunday breakfast destination for the "South Haven Tribe" of which my Piper Warrior was once a happy member. 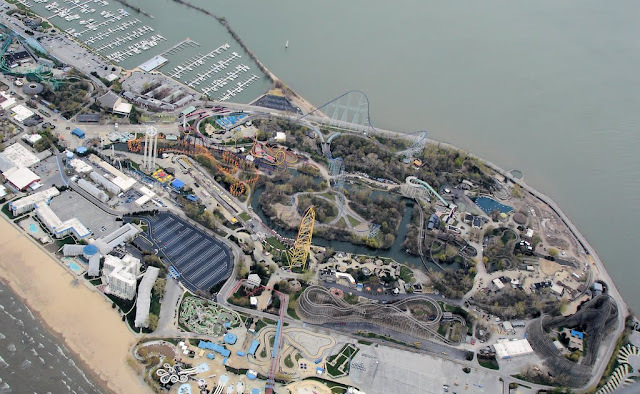 Following the Lake Erie shoreline toward Cleveland, I notice a densely packed little spit of land jutting into the lake. The point is free of homes or condos. Instead, it is dominated by rolling curves and spindly towers painted brightly from a palette of primary colors. 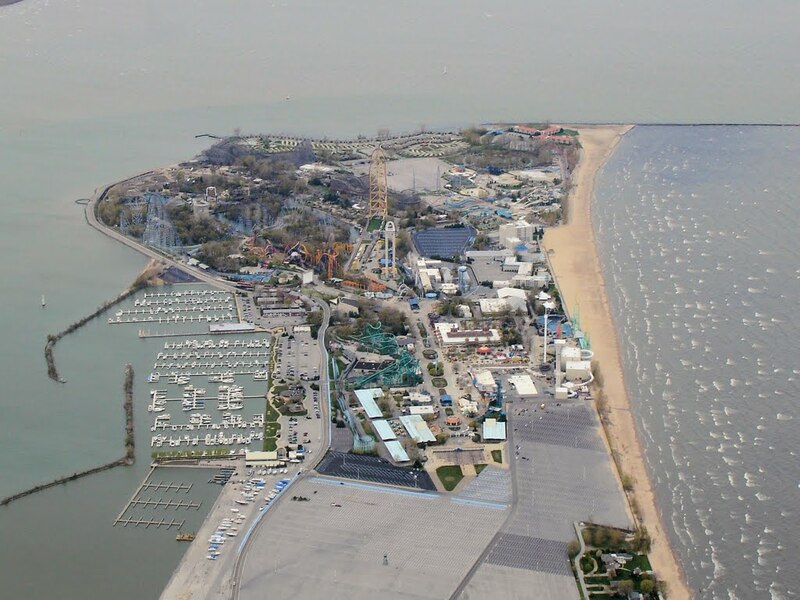 I run my finger along the sectional chart: Sandusky, Ohio. Of course. I am looking at Cedar Point, one of the premiere amusement parks in the Midwest. I circle the park, which is quite obviously closed for the season, before continuing eastbound. A nearby power plant along the shoreline makes for an impressive windsock, telling me that I am now facing a headwind as opposed to the tailwind I had leaving Kalamazoo. I let down toward the Portage County airport after two hours aloft, briefly sharing the pattern with a couple of Cessnas practicing touch and goes. As the propeller stops, I notice something that, to me, invokes an instant hotel stay in Ohio. There is oil on the back of the prop. The oil appears to be seeping from the propeller hub, driven along the length of the propeller through the force of its spinning. I refuel the airplane and open the cowling to check the oil. Six quarts. Exactly the amount I observed in Kalamazoo before adding the extra quart. Given the oil on the back of the prop, I obviously have a leak somewhere and managed to lose a quart of oil in two hours. I wander toward the FBO building looking for (1) help and (2) a restroom. The FBO is closed for the day. According to the hours posted on the door, I have arrived thirty minutes after closing time. I am faced with the prospect of finding some place to stay in an unfamiliar town. Oh, joy. Walking back toward the wounded Warrior, I notice that the hangar door of the maintenance shop is slightly open. I venture inside, taking in a tidy hangar space home to several aircraft. A mechanic is working on the nose gear of a Cessna. By now, my priorities are reversed and my first question to him is for directions to a restroom. With that out of the way, I describe my problem and ask if he minds taking a look. He grabs an inspection mirror and a flashlight from his toolbox and follows me back to the Warrior. He inspects the prop and spinner for a moment and asks, "have you, by chance, just had the crankshaft inspection AD performed?" This inspection involves examination of the crankshaft bore for corrosion and requires removal of a plug at the end of the crankshaft. When I answer in the affirmative, he nods at the verification. "This happens all the time. The plug in the end of the crankshaft sometimes doesn't seat properly when reinstalled and can fall out within a few hours. You effectively have a hole in a low pressure region of your engine and can lose some oil through it. It should act much like a second breather." I describe the oil consumption behavior and he nods again. "You will obviously want to get this fixed, but it will get you home without any real problem. You may lose a little more oil as it sloshes around inside the engine, but it appears to have found its new level at six quarts." We talk longer and I pepper him with questions to feed my decision making process. As pilot, the final decision is mine. There are really only two options: stay the night and try to get the airplane fixed locally or fly it back to Le Roy and have it fixed later. The mechanic is confident that my Lycoming O-320 will carry me home without any problem. Despite his confidence, a two hour flight home with a known oil leak is a daunting prospect. And sunset is a mere hour away. I weigh the expert's advice against my fears of catastrophe. The mechanic obviously knows more about this engine than I do and his diagnosis matches the oil loss behavior perfectly. In my professional life, much of my job requires making decisions based on available data; finding a balance between the extremes of knee jerk conservatism and indulging in unnecessary risk. In the end, the rational explanation appeals most and I decide to go. It is obviously not the most conservative solution to the problem, but I decide that the risk is mitigated by the mechanic's input. I thank him for his time and promptly depart Portage County hoping to seize what little daylight remains. The Warrior shakes tremendously for a few moments as we climb away from the runway - another reminder that the prop balance issue must be dealt with when I return to New York. Despite my lingering concern about further oil loss and a near obsessive fascination with the oil pressure gauge, the flight home is magnificent. In the nascent dusk, the air settles into quiescence and the Warrior swims through it as though immersed in still water. Once pointed on course, I leave the controls untouched for well over thirty minutes and the airplane holds course and altitude so faithfully that it seems to be riding along an invisible rail. In the gradual transition from day to night, the radio chatter subsides and the lights of Buffalo form an oasis of color in the gathering darkness. The last vestiges of color in the twilight sky finally dim to a vague purple glow on the western horizon. I follow I-90 home, a prudent practice when flying a single engine craft at night over the terrain of western New York. In the distance, I can see an airport beacon: Genesee County Airport in Batavia, NY. The next collection of lights east of Batavia must be Le Roy, though I cannot see the airport beacon there. I have always enjoyed navigation at night, simply counting off each cluster of lights to determine which city is which. The GPS is on, as always, but I leave the screen dark lest it intrude on the peaceful darkness suffusing the cockpit. I do not need it for navigation. Even the rumble from the engine seems muted as shadows spread across the landscape. Within five miles of Le Roy, I am still unable to find the beacon, my eyes searching a dark region just east of town where the airport should be. Seven rapid clicks of the microphone key brings the runway lighting up to full intensity. My home airport blooms in the night at the exact location my eyes are focused. Descending toward Le Roy, I announce my intentions to the void. No one else is broadcasting. With the arrival of complete darkness, the red pulse of the Warrior's tail strobe flashes off of wing surfaces in my peripheral vision. Occasionally, I catch a red tinged coruscation from ahead of the airplane as the strobe and propeller fall momentarily into phase with each other. I've never seen this before, but then I realize that the normally non-reflective backside of the propeller is coated with an oily sheen. This cringe-worthy thought is immediately followed by another: I am almost home. I reach forward and toggle the landing light. Nothing happens. The usual telltale shimmer of the propeller spinning in front of the landing light is absent. I toggle the switch back and forth a couple of times and watch the ammeter. No change. The landing light was still working when I left Ohio; I checked it before departure. Then I remember the excessive vibration while launching from Portage County and realize that this probably shook the guts of the landing light to pieces. A new creeping discomfort steals through my mind, but its effects are banished with the memory of practicing nighttime landings without a landing light during flight training. I silently thank Bill, my instructor, for those drills. I can do this. I have done it before. Once in the traffic pattern, I finally spot the airport beacon and resolve to tease Ray, the airport manager, about its wimpy output. On final approach for runway 28, I am aimed at a black rectangle of pavement surrounded by multicolored Lite Brite pegs. There is no depth to the runway, it appears as a black bottomless pit at the center of the airport. Gliding earthward, the runway surface gradually materializes in the glow from the runway lighting. I close the throttle and pitch the Warrior nose high, feeling for the ground with pneumatic rubber feet. I am rewarded with a gentle bump as the main gear rolls onto the pavement. It is probably my best nighttime landing since I bought the Warrior two years earlier. Back in the hangar, I pat the Warrior's fiberglass snout in gratitude for another safe, wonderful flight. It's a ritual made more meaningful by the circumstances. I unlatch the cowling and check the oil. Six quarts. The mechanic at Portage County was right. A few days later, the Warrior is fitted with a new crankshaft plug and, this time, the propeller stays oil free. The propeller is also remounted in its original orientation. Not only does the maddening take-off vibration disappear, but my new landing light remains intact. I suspect that vibration from the previous propeller orientation was probably a contributing factor to losing the crankshaft plug in the first place. Was my decision to fly home a sound one? It is often said that "hindsight is 20/20", but that sentiment does not really apply in this case. Obviously, the final outcome of the flight was a good one. This makes for an interesting debate among my aviator friends. The split is nearly 50/50 between those who thought I made good use of available data versus those regarding a Motel 6 in the heartland as cheap insurance. Is there a moral to the story? This time, I am not so sure. The breather is a vent in the top of the crankcase to prevent it from over pressurizing. It also tends to be a point of oil loss when too much oil is in the engine. For example, the oil capacity of my Warrior is supposedly 8 qts, but in practice, 8 qts is too much and one of those quarts will be quickly lost through the breather until the level reaches about 7 qts. Unfortunately, the breather vents to the Warrior's belly, where the excess oil picks up dirt and grime that can foster corrosion if left unchecked.